Since I started my official web site a few weeks ago, I’ve had a few people ask me about the image in my banner. 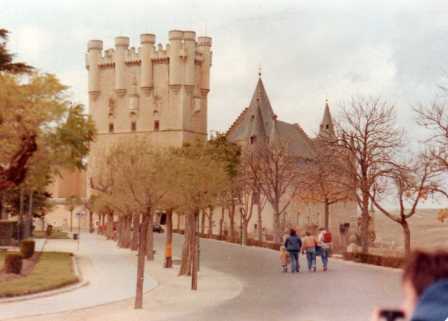 It is a highly cropped photo I took in 1983 of the Segovia castle in Spain. The Segovia castle is what I consider one of those Disneyland castles and is my favorite of all the castles I’ve visited in Europe. It was about a two hour drive from our house and was a great day trip to visit not only the castle but the town with it’s winding streets and the ancient Roman aqueduct. The castle is open for tours and today is the home of the Spanish military archives. It is also the place where Columbus asked Queen Isabella for permission to sail to the new world. Right inside the entrance is a little door to the side that is now locked. However, back in the early 70’s, the first time I was stationed there, it was possible to sneak down there. A winding staircase leads to the dungeons under the castle and you can get lost down there as they go on forever! This is the whole photo, in case you’re curious. Great blog Fred, particularly the part about the many dungeons. My grandfather, Antonio Maseda, my mother’s father, was from Barcelona, a shrew old guy and not very pleasant. I’d love to go to Spain someday and check myself into one of castle dungeons. That would make a great blog. Thanks Felix! I may do a few blogs on my experiences in Spain and Turkey. Though this site is mainly about my writing, I’m not opposed to veering off into other things. That rings true, especially since many of those experiences directly relate to inspirations for some of my stories. In fact, my novel Spanish Gold is based in part on civil war tunnels my wife discovered with her friends in Madrid when she was in high school there, along with some of the castle ruins I explored as a young airmen. Yes, I see a future blog in the works! One day… Thanks again for the comment!